Sustaining payments and late nominations for the 2019 Texas Classic Futurity and Derby series are due Friday, February 1. ELGIN, TX—FEBRUARY 11, 2019—Sustaining payments for the 2019 $1 million-est. Texas Classic Futurity(G1) and the $400,000-est. 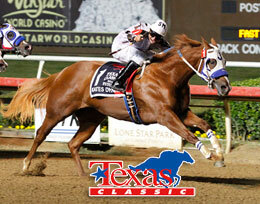 Texas Classic Derby(G2) are due Friday, February 15. A $300 payment is due February 15, 2019 to sustain American Quarter Horse foals of 2017 to the 2019 Texas Classic Futurity(G1). Late nominations for $800 ($300 plus all payments to date) will be accepted to the futurity through February 15. Trials will be contested October 19th at Lone Star Park and the final is set for Saturday, November 9. A $300 payment is due February 15, 2019 to sustain American Quarter Horse foals of 2016 to the 2019 Texas Classic Derby. Late nominations for $800 ($300 plus all payments to date) will be accepted to the derby through February 15. Trials will be contested October 18th at Lone Star Park and the final is set for Saturday, November 9. CLICK HERE to download a nomination blank for the Texas Classic Futurity and Derby series. Nominators must be a current member of the TQHA at time of nomination, membership dues, if necessary, should be included with nomination. Completed sustaining payments and late nominations must be postmarked and mailed no later than February 15, 2019 to: Texas Quarter Horse Association, 14 N. Main, Suite B, Elgin, TX 78621. At Time of Entry $1,200* - $50,000 Supplemental nominations + all fees due at "Time of Entry" to trials. For additional information contact the TQHA office at (512) 458-5202 or visit the association's website at tqha.com.